NAB 2017 showed that the early demise of the SDI interface as a bit of an exaggeration, as it has found new life with the adoption of 12G as an interface on a range of new products at the show. The reasons for this are many fold and includes the well-established specifications for 12G-SDI and the inherent understating of how to connect the output of one black box to the input of another, making installation and maintenance straight forward. There seems to be a desire by many to adopt the SMPTE 2110 video over IP standard which is the final stage of the AIMS Alliance implementation. Many manufacturers who have already implemented SMPTE 2022-6, however, are waiting for full ratification of the standard and implications before further investing in full product implementations supporting SMPTE 2110. This makes the choice of whether to invest in SDI or IP test equipment a difficult one. Omnitek has decided to simplify the choice with one box that does both. 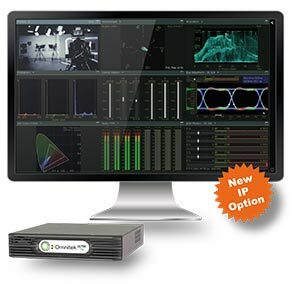 At IBC this year, Omnitek will be demonstrating its new Ultra TQ which supports the analysis of video over SDI or an IP link as a SMPTE 2110 / SMPTE 2022-6 enabled waveform rasterizer for broadcast applications. The Ultra TQ can be booted in normal operating mode to allow physical later analysis and monitoring of SDI signals up to 3G or booted in IP mode to allow the monitoring of SDI video or SMPTE 2022-6 video. This means that all the conventional tools such as picture, waveform, vectorscope, gamut meters, CIE charts, audio meters, loudness graphs, etc are available in both SDI, SMPTE 2110 / SMPTE 2022-6 or mixed installations. The Ultra TQ is a highly cost-effective solution as customers dont have to have 2 distinct sets of equipment or chose SDI or IP. Omnitek believes that IP is just another connection type and it will not penalise its customers for changing technology and advancements in the industry. For all those just wanting to check the quality of the content, and not design an IT infrastructure, the Ultra TQ is an obvious choice. The IP option on the Ultra TQ can be purchased, at nominal cost, at any time. The Ultra TQ option structure has been designed to provide the basic functionality required as standard with options to enable the more sophisticated functionality for more specialised analysis. The Ultra TQ was designed to support both SDR and HDR production and provides all of the necessary tools to do this. In the Ultra architecture, it does not matter how the video arrives, it can be monitored and analysed using the same intuitive user interface. The Ultra TQ can support PQ, HLG and S-Log production work flows and allows the section of different input and output profiles to automatically configure the system to suit the chosen work flow. When you first make the decision to purchase an Ultra TQ you only need to purchase the functionality that you need immediately. Extra functionality can be added in the future as required. If the ground moves under your feet, or the goalposts change, you can upgrade or cross convert to any of the other Ultra family products.